Copyright 2011 Taylor & Francis Group, LLC. Postmortem research on the brains of American tackle football players has revealed the presence of chronic traumatic encephalopathy (CTE), a degenerative brain disease caused by repeated head trauma. Repeated concussion is a risk factor for CTE, raising ethical concerns about the long-term effects of concussion on athletes at risk for football-related concussion. Of equal concern is that youth athletes are at increased risk for lasting neurocognitive and developmental deficits that can result in behavioral disturbances and diminished academic performance. 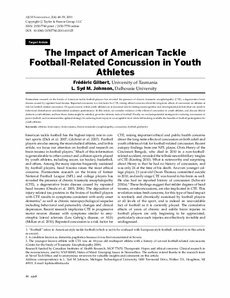 In this article, we consider evidence of the effects of concussion in youth athletes, and discuss ethical duties to youth athletes and how these duties might be satisfied, given the intrinsic risks of football. Finally, we evaluate potential strategies for reducing concussions in junior football, and recommend the optimal strategy for reducing brain injury to an acceptable level while still making available the benefits of football participation for youth athletes.